If you didn’t pay much attention to Brawlout when it was originally released on the Switch eShop at the end of last year, perhaps now you will. 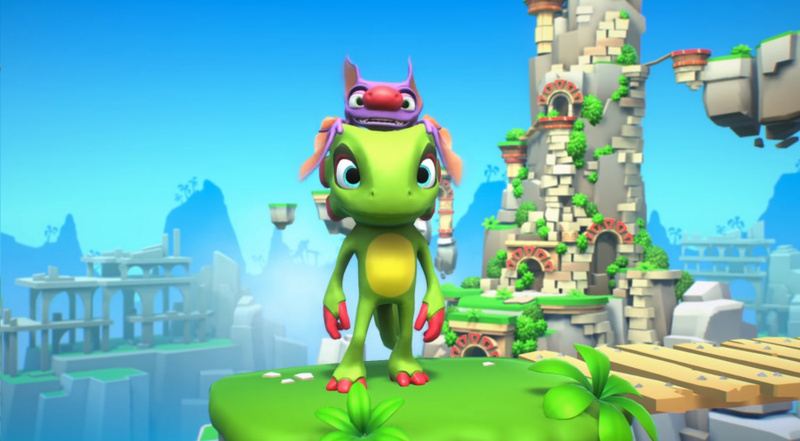 Playtonic’s Yooka-Laylee has just been revealed as the latest guest fighter for the game. Based on the trailer below, it looks like the deadly duo will have all of their trademark attacks and their very own level. We awarded Brawlout seven out of ten stars and said it was a title obviously inspired by Super Smash Bros. - with the action feeling fun and frenetic. Although this guest fighter announcement came in the form of the PlayStation 4 reveal of the game, it’s safe to assume the update will at some point make its way across to the Switch version. Previously released guest fighters in Brawlout include Juan from Guacamelee! and Hyper Light Drifter. 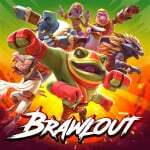 Do you own Brawlout on Switch? Will this encourage you to play it more often? Tell us below. Fun while it lasted, but as soon as Smash hits store shelves, R.I.P. Brawlout. A new character for a fighting game that's doomed to be irrelevant by the end of this year? Yaaaawn. It's the closest thing we'll ever get to Banjo-Kazooie in Smash. We just need Hat Kid next. I didn't play much of this, it was annoying to play and it was annoying to unlock anything, needless to say, I prefer smash and will be playing ultimate 999999999999999999999999999999999999999999999999999999999999999999999999999x the amount I played this. @N00BiSH Yet it's neither Banjo-Kazooie...nor Smash. @Nintenrocket I wouldn't say my heart stopped, I was more perplexed than anything, but my initial thought process was the same as yours. If this game had a few more prominent indie faces like Shovel Knight, Shantae, and CommanderVideo, I would probably buy this game. 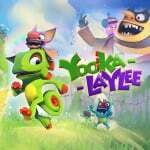 As it stands, the Yooka-Laylee inclusion does make for a more exciting package as I quite enjoyed the game despite its mixed reception and myriad of quality of life issues. I also just think Yooka and Laylee are very well-designed characters. However, it's not enough for me to want to buy the game, especially, as others have said, with Smash Bros. on the horizon. Smash Ultimate isn't here yet so it's great to have a good alternative until the ultimate showdown. I welcome Yooka-Laylee to Brawlout. Hopefully next they bring in Shovel Knight and Meat Boy to the roster as well. The game is alright, but my biggest gripe is how annoying unlocking the clone characters are. @Not_Soos Shovel Knight is appearing in Blade Strangers, another fighting game. This game looks ok, but by time I finish my backlog, Pokemon and Smash will be out and any Smash clone will then be irrelevant to me. I'll be getting all the fighting I need from Blade Strangers, provided it doesn't turn out to be bad, and Smash Ultimate. When this game seems unpolished to me. On a side note, do we know when Rivals of Aether is due out on Switch? I'd like to get my hands on that as well. @Smigit I just think it would be nice to see a lot of these major faces in the video game indie-stry (ya see what I did there? ) collectively appear in a single fighting game--an "Indie Smash Bros.," if you will. I'm not actually sure what Blade Strangers is, but Shovel Knight alone as a guest character doesn't make me terribly excited. @Not_Soos YL was actually quite brilliant, at least in terms of what it was intent to be. All the more negative press I saw complained that it basically didn’t differentiate itself from BK, or the complaints were things that were just as applicable to BK (and collectathons in general) Which is fine, the genre has its warts, but considering it was promised to be a spiritual successor to BK it’s sorta silly to then complain when it’s so similar to BK. I hope YL becomes a franchise of its own (it could use some polish but that comes with time), I smiled from beginning to end with that game as I felt like a kid again. I even 100%ed it twice. Then again... the minecart minigames weren’t even fun for a moment (and Rextro’s later minigames). I get that it was the point, they literally acknowledge in game that they aren’t fun, but if you reach the imminent where you have to acknowledge that, then you don’t need to include it. I really hope we get a sequel, but those two parts can stay home. Added clarity: minecart levels aren’t inherently bad, look at Tropical Freeze for how to make incredibly fun ones. But if we’re trying to make the controls more clunky for the sake of nostalgia... we’ll that’s my own gripe, the game was a solid 9/10 for me. @Not_Soos Blade Strangers looks to have a bunch of other cameos, mainly Nicalis published titles like Cave Story etc. if you want a indie game beat em up it may fill the void if it proves to be ok. It’s not out yet though. It's good Yooka-Laylee is in Brawlout but the biggest put off of all is how close the logo looks like Smash Bros Brawl. I hate that sort of unoriginality. I wonder how hard it would be for Yooka-Laylee to be in smash? Or better, Banjo-Kazooie? Brawlout looks ok but its competing against the perfect game of its genre. @ShadJV wow, 9/10? I'd give it 5/10 and I'm a big fan of Banjo. Rextro's games and the minecart levels were abysmal. There were a lot of other frustrating things that made it hard to enjoy the game. I find it a struggle to enjoy getting 100 pagies nevermind complete the entire game. A lot of it is tedious. The biggest problem is that Banjo, a 20 year old game, does so many things Yooka tries to do, much better. And the world needs to be Banjo size. They're needlessly big and don't add anything to the game. @Banjos_Backpack as stated, the Rextro games and minecart challenges are the things I think it did wrong. The worlds didn’t feel any bigger than BT which is one of my favorite games of all time (I replay it every couple years, 100% every time). It feels like exactly where BT left off in terms of experience, other than having less worlds than I wanted (but given the studio was just starting off, that part didn’t surprise me). If you look at the community reaction though, people’s opinions are all over the place. There’s people like you who consider it a flop and people like me who found it incredibly fun. I’d have played it more if I had the Switch version (for portability) but given I was a backer I just wanted my copy ASAP. I was quite happy and will stand by my love of it. Opinions are opinions though. @ShadJV honestly I'm jealous that you enjoyed it so much and I'm glad to hear you did. I wanted to do much and tried not to treat it like a Banjo game, rather its own entity. I played a bit with my backer copy but it hurt the experience a bit so I stopped and waited for Switch. A lot of the criticism is unfair and upon watching reviews of it criticising it for being a 3D platformer, I couldn't believe people were approaching it in the wrong way. Small but more levels would have solved a lot of problems. Kickstarter was its own problem, but necessary to give the studio potential. I'm optimistic for Playtonics future. @Banjos_Backpack yeah well as I did admit, it wasn’t as polished as it could be but once again... I think that’s due to Playtonic just starting out and it didn’t hurt my opinion of the game. Then again, it was like the fourth or fifth game I Kickstarted and the previous titles... well, one was Mighty No. 9 (sadly I’m in the group that felt that didn’t live up to expectations), a lesser known title called Nefarious (which wasn’t horrible but ended up feeling like a flash game to me which was disappointing), and Shantae Half Genie Hero (which I loved but honestly Wayforward didn’t need KS, they were an established studio). I might be missing a game (hence why I said YL was fourth or fifth) but point is, I started to get skeptical by the time YL came out so having lower expectations might factor in how much I enjoyed it... but I was also starved for the genre, collectathons have become rare (no pun intended) and as many times as I’ve replayed BK, BT, and DK64 (to me the purest collectathons we’ve had) I just wanted something new, those games were my childhood. The only times I felt truly frustrated in YL was in the Rextro games (and the first couple I actually enjoyed) and the minecart (that boss did make me rage a bit), outside of those I enjoyed the adventure enough to play through twice. Uhm trailer looks pretty neat, I would maybe pick this one up as Smash hasn't done much for me since Melee. Yeah one of those guys. Sometimes I hate the gaming community. I’ve just recently been playing Yooka Laylee... and I think it is awesome. The closest thing we’ve gotten to Banjo Kazooie in modern form. A better effort than what Microsoft and modern Rare did.... from and indie studio!! It’s got amazing things, level design, music, characters. To be honest, if it wasn’t for a simple character swap it would be Banjo Threeie. But yet, the community bashed Playtonics effort.... so I will say the following .... [removed] community. This game was amazing and it filled my teenagers desire for a Banjo sequel. @fafonio I’ve held out for physical and I’m looking forward to it. Glad to hear others aren’t so down on it. Brawlout is 11.99 on Switch eshop right now thats a great price for a game this good. @DownRightSam did the update fix that much? Because the cpu was waaaaaay to hard to beat. & the system for unlocking new characters is so slow going and actually SUPER CRAP. Well then. That does it. I'll have to get this game eventually. @ShadJV Nicely orchestrated point my friend. I didn't have the same experience for expectations but I promised to treat it as a separate thing to Banjo. My problem was mainly the simple things that were done better in Banjo. They over complicated some things for themselves but they were used to working behind closed doors at Rare rather than the open book of KS with money of investors (with the added bonus of them being fans), it created a strange relationship and going forward they probably won't have that which allows them to focus on their own creativity rather than meet their creativity with the expectation of thousands of people. I think while there was a lack of hunger in modern gamers for a 3D collectathon yes, but now after Crash, Mario, YL, it's came back. Mario Odyssey done for me what it done for you I think. I absolutely adore it. It was the nearest to Banjo I've experienced since Banjo itself. But it also felt quintessentially Mario. It was the stuff of dreams. You make fair points. It was tough for Playtonic it always was going to be but I hope they work to sort the simple things out next time. Better control, camera and all in a smaller more engaging and interesting environment like Banjo had. They have the talent to produce many fantastic titles. Yooka-Laylee was still fun but it got frustrating to play for me about half way in. I can't say the same for those 3D rare games. And I loved DK64 despite its criticisms. I really don't mind Yooka and I appreciate it. It's a decent first entry considering their challenges and I'm really hopeful for new original ideas in a range of genres. There's plenty to like about Yooka. The characters, rolling to travel fast, some of the environments, the music, but the writing missed Leigh Loveday, like we both say, Rextro and Kartos aspects need to take a step aside... Many things positive and negative which will help build incredible future games. I greatly appreciate their effort and talents. Especially to come together to create a business fans will love. @fafonio I feel this might be in indirect response to my comment? Or maybe in general? I don't support the community dissing YL, I'm grateful to have it I just wish the simple things were a bit better mostly. It made the game a chore to play at times unfortunately. I feel it gets a lot of unfair criticism. That's not cool. @Banjos_Backpack fully agree, fingers crossed, they had to establish a new world but they did that and now they can focus on moving forward. And given the ending, it seems likely they at least have ideas for a sequel. KS actually has the other disadvantage you touched on - having to be transparent with fans through the development. And the reason this is bad is... well, when I was in college they always told us gamers don’t necessarily know what they want or what would make a good game - they might know but they also might have different ideas of what they think will work compared to what will work (doesn’t mean studios should ever ignore fans), and being forced to continually have updates, treading on eggshells to make sure the audience is happy on how it looks at any given moment... it interrupts the natural development cycle where they try stuff and learn something isn’t going to work. Instead they try something, realize it isn’t working, but crap they showed it to everyone so they can’t cut it out so let’s just force it in as best we can and keep moving forward so we have another thing to show next month. It’s just not how games naturally develop. I didn’t fully consider the number of games starting to revive the old genres but that’s a good point, and I never even considered just how much Odyssey really did borrow from collectathons... and the thing I like to praise Odyssey most for is it had a ridiculous amount of things to collect but they all boiled down to TWO things: moons and coins. That’s it. Instead of DK64 having bananas and golden bananas and banana fairies and banana medals and keys and blueprints and crowns and a Nintendo coin and a Rare coin and to some degree regular banana coins and now do it all again with 4 more characters... look, I love DK64 too as I’ve made clear but I’m aware of the things it’s criticized for, and the beauty of Odyssey is it shows we don’t need a complex network of collectibles to be a good collectathon, just have them not too spread out and have ways in game figure out where you’re missing stuff (purple coins sometimes got a little irritating for 100% but it was minor). I still wish for real Odyssey DLC just because I want more and there was nothing quite like it. Not that I’m saying YL needs to cut down to 2 types of collectibles to be good either though, as BK and BT did fine and they competed with DK64 there (minus having 5 different characters). My point is mainly that the solution isn’t always “add more different things” which is an easy mistake the genre makes, it’s more nuanced than that, there’s a lot of factors and Odyssey was similar to these older collectathons yet very different at the same time. @Vlad it was a huge patch. They got rid of the random pinatas/loot box for character unlocks. You just choose which character to unlock now in whatever order you want. They tweaked and balanced a lot and made single player and multi more enjoyable. @Aozz101x Rivals of Aether has Ori so automatically superior. @RichardZ sorry, i have no preference. if you're saying that "Rivals of Aether" is the superior of smash clones. i'll be willing to try it. Edit: ah, $15? Pretty Positive? not bad. i'll add it on the wishlist. @Aozz101x was just a joke cause Ori is an awsome game. But From what I have heard Rivals of Aether is better. @RichardZ Oh, no hard feeling. thanks for recommending! It's too bad Brawlout might as well not even exist with the new Super Smash Bros right around the corner. @DownRightSam I can't help but to have a feeling of "too little too late" when it comes to the recent improvements to Brawlout. If the game was like that back when it released I would have definitely bought it, but at this point with the new Smash Bros coming out this year my interest in Brawlout is no longer there. I might pick it up if they make it really cheap on sale, but only out of curiosity. If this is the Smash for indies, why not? Yooka-Laylee, Juan from Guacamelee, and Hyper Light Drifter are cool characters. They just need more of them, more of the biggest indie characters anyway, and I hope they will add more in updates, mainly because the main cast of original characters is rather boring. If the cast gets bigger with more interesting characters, it could live next to Smash Ultimate. @Banjos_Backpack jaja no... I didn’t even read your comment before my post. I’m reacting because I heard so many bad things about the game. I was hyped for it but waited years for the switch version. I downloaded it last week (because of backlog) .... and I found the game absolutely charming and a true Banjo sequel. Obviously the limitations from being an indie studio shows. But I mean, it’s way better than Nuts and Bolts. I’m happy with this spiritual successor and I’m looking forward for a sequel. If this is the only kind of Banjo game I’m gonna get in my lifetime..... I’ll take 10 sequels please. They have this, but no Switch port of Yooka Laylee? sad. @VR32X it’s due next month.... I’m waiting too. I’m hoping they are more guest appearances.... even characters from the guest games already featured would do. In fighting games the more the merrier for me. Ordered this when I saw this announcement of this it tip me over edge and physical was £23. I’m building a nice physical collection just over 50 now. @ShadJV you summed up my point about the transparency of KS well. Nail on the head. I don't imagine the Playtonic staff will have worked best that way. I'm delighted we have heard of any new games and I hope it is just sprung upon us with a release date and very little to go on other than a teaser of gameplay. I'm excited to see the other characters in action in different games, and their own games. I really like Trowser and Rextro as characters. I'd take Odyssey DLC too! I really hope that game isn't done and dusted. It's strange, Nintendo really make you want DLC more than anyone else in the industry. Simplicity is greatness and Odyssey, in my view was perfect. I'm thankful that Yooka got the 3D platformer genre on the map somewhat again too. Odyssey was a joy just to run around, jump, and the collectables feel achieveable but a challenge. Like you say, more isn't always better. I still think Banjo-Kazooie is just the right amount of collectibles for a team like Playtonic and I hope they use that game more as a template going forward. The world size, character personalities, world personalities, secrets, controls and camera. I am also a sucker for the sparkle effects like when Mumbo uses magic. Or the one from the feathers as you fly. I also hope we get a new 3D DK! It's well overdue and I enjoyed DK64 strangely more than any 2D DK. Rextro's games are definitely redeemable and like you say the controls and length of them is the main issue. I'd also say the volume of them. There are too many and they are all bad. Plus there all retro themed so it's harder to mix them up like the ones in Banjo I guess. I really could live without minecart levels and Kartos. Honestly it is a painful experience isn't it? Although not all Rare members are at Playtonic, I am sure that Playtonic can do much better than this. I can't wait to see what they do next. A new Banjo co-developed with Rare? @Aozz101x How many fighting games like Smash are out there? Wow. that yooka laylee level couldnt look more uninspired. Doesn't look very fun if you ask me. No interesting characters, no items, very basic stages.